Looking for a great last minute gift that also supports a good cause? 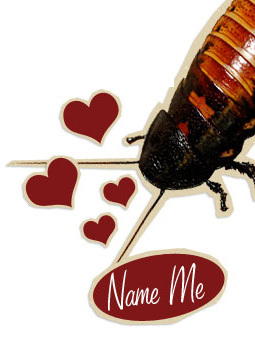 Name a Madagascar hissing cockroach for your Valentine at the Bronx Zoo. Your Valentine will get a personalized ecard on Valentine's Day with a certificate letting them know that a cockroach has been named in their honor. And not just any old roach. But a Madagascar hissing cockroach, the biggest and loudest of the bunch. Many people may not immediately associate roaches with romance. But consider the fact that your average roach may produce tens of thousands of offspring in their lifetime, and you realize what true romantics they are. Naming a cockroach requires a $10 donation, which helps the Wildlife Conservation Society conserve species big and small.